The Lladro Porcelain Company was founded in 1953 by three Lladro brothers – Juan, Jose and Vincente – who at the time were farmers with an artistic bent. They started a porcelain business in the Valencian village of Amacera, Spain. Because of the natural artistic abilities of these talented men, the Lladro Porcelain Company is now a gigantic company, exporting their respected wares to a wide international market place. 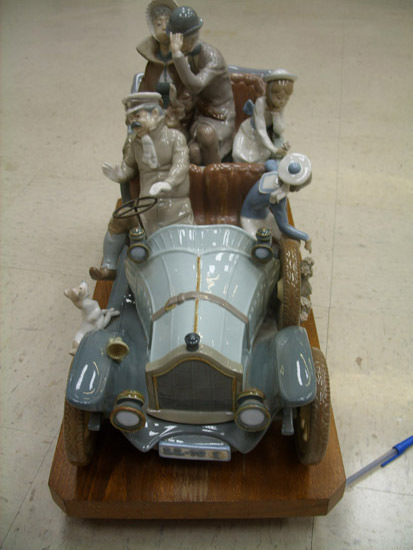 This porcelain open touring car, depicting its owner and family enjoying a ride in the country, was produced in 1970 and was their first venture into automotive pieces. It became an immediate success. 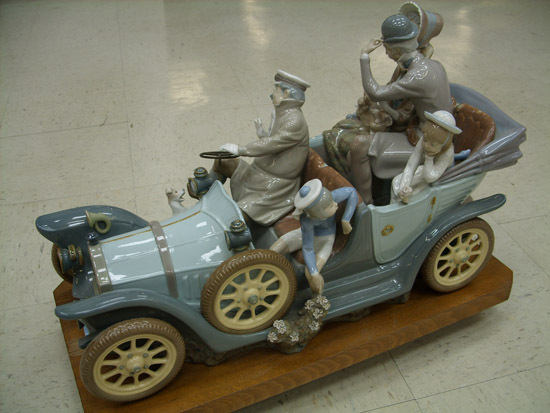 The finely crafted license plate reads “LL 70 E.” Approximately 700 of these outstanding (and incredibly delicate) models were sold, the majority to leading automobile museums and enthusiastic collectors. There were two sizes produced by the Lladro factory. This one, measuring 23″ x 8-1/4″ x 13″, was the smaller of the two. This example is a remarkable survivor. 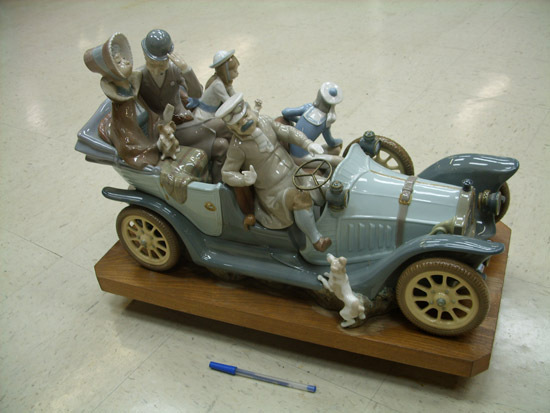 Though the vehicle’s porcelain trunk is missing it’s absence can be forgiven, considering that the original owners of these objects rarely part with their masterpieces.